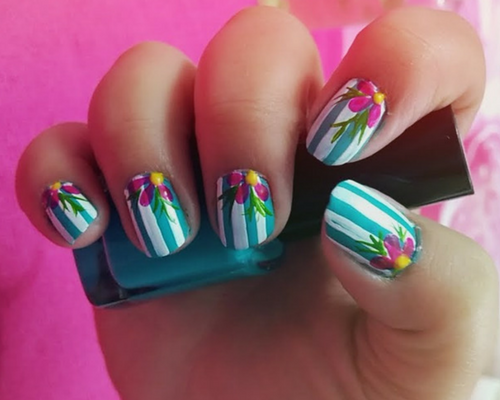 Let’s try beautiful flower nail art designs Today! Girls have you ever given a thought to painting your nails at home the same way as we use to paint a canvas in childhood. Yeh!!! Its right time and place where I will help you paint your nails with unique easy flower nail designs to do at home. This step by step tutorial will do your task easier and manageable, here you will discover new techniques for such design. To relieve basic rules you need to read in this article thoroughly so that the complexity of nail art can be removed. It is not necessary to copy the full nail art design you can add your own ideas if you feel like. Your Nail Polish can stay for a longer time if you dip your cotton ball into vinegar and smoothly apply it to your nails before starting your nail art. Always apply a double or triple coat of Nail Polish so that transparency of polish is not apparent. Guard your edges from nail polish, still some time its get messy than you can use earbud dip it in remover and remove extra polish. Keep your Nail paints in dark so that you can avoid it from getting dry. For instant dry of nail paint, you can slide your hand into cold water for 2-3 minutes. Let’s start with flower nail designs for beginners. Never forget to apply base coat because this will preserve us from the yellow stain on nails. 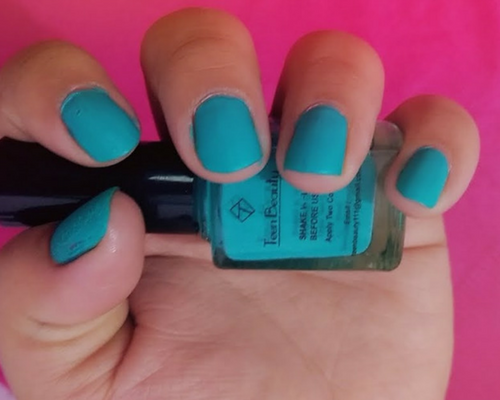 Once it gets dry apply your Pine Blue base nail polish with double strokes. Make sure to avoid touching your nail paint brush on side cuticles. If still nail paint get a touch on side cuticles of your nails, take earbud dip into remover and clean it gently from sides of nails. 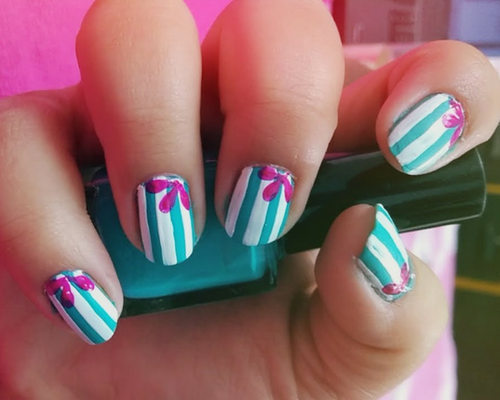 For this long white strip, you use your striper nail art tool. If you are expert in drawing straight lines than you can use this method. Take a few drops of white nail paint in painting tray, with the help of brush make a thick line on your nail paint base. Still finding trouble in drawing straight lines, you can also use tape. Let’s discuss how? Cut the tape of the same thickness as white lines you need, paste it straight into nails. Immediately apply white nail polish on the empty space once done remove the tape gently with a tweezer. 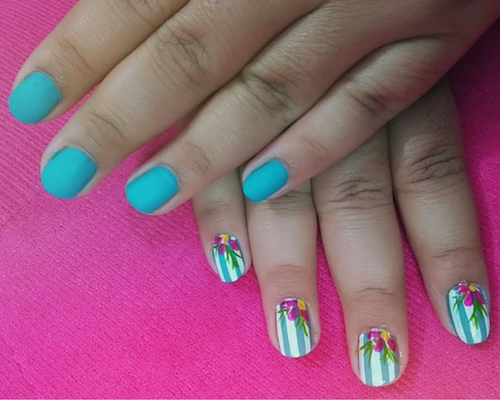 You will observe the same flower nail art designs as shown in the image. It’s time to pick your dotting tool. You can choose any color for flower nail art designs, here I have used bright pink. Dip few drops of pink nail polish in color tray than dipping your dotting tool into it. Apply three dots in a curve, with the help of toothpick or nail art tool scratch the dots from out towards in centre point. You will find the same as the shown image. Take your striper brush and use neon green nail polish to combine random curves lines. For making more thin lines you can keep on cleaning your brush tip so that you can get thin curves properly. However, interconnect the curves to make branches. Better choose some natural color for pretty Flower look. I have added Yellow polka in the centre of Pink Flower to give complete Nail Art Design. If you don’t have polka tool you can make use of a toothpick to add centre dots in flowers. 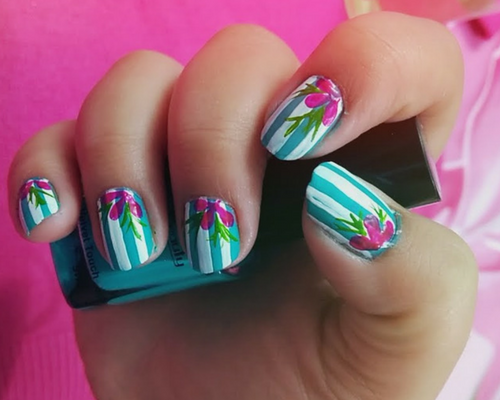 This is how your Floral Flower Nail Art Designs looks! Don’t forget to add a top coat for the long lasting stay. Enjoy the same design with your own favourite colors.